(AP) DETROIT - General Motors (GM) is trading an oval-shaped football for a round one. The company, which earlier this month scrapped plans to advertise during America's Super Bowl, has signed a deal for Chevrolet to be the automotive sponsor of Manchester United, the wildly popular British team that plays a different kind of football. GM formally announced the partnership on Thursday, saying that the five-year contract will take advantage of Manchester United's huge soccer fan base to help make Chevy an iconic global brand. Six of every 10 Chevrolets are now sold outside of the United States. Manchester United claims to be the most popular sports franchise in the world. Its fan base has doubled in the past five years to 659 million people, according to research done for the team. That's nearly one tenth of the world's population. Half of the fans are in Asia, with many in China, where GM sells more cars than in any other country. The deal comes just a few weeks after GM's decision to snub the Super Bowl and to stop advertising on the Facebook social media site, saying the ads were ineffective. Money saved from those moves will stay in North America and won't be diverted to pay for the Manchester United sponsorship, said Joel Ewanick, GM's global marketing chief. GM intends to hold its global ad spending at about the same as last year, $4.5 billion, he said, adding that the company will spend more on actual advertising because it's saving money by consolidating ad agencies and media buying. Still, the automaker's shunning of Facebook and the Super Bowl have brought criticism from the advertising and auto industries, and it left many wondering about GM's strategy. The strategy is still in the works, but Ewanick said GM will advertise heavily on other NFL games, especially as it launches new pickup trucks and other vehicles during the coming months. GM was the third-biggest advertiser in the U.S. in 2011, spending $1.78 billion, according to Kantar Media, an advertising research firm. Only Procter & Gamble and AT&T spent more. 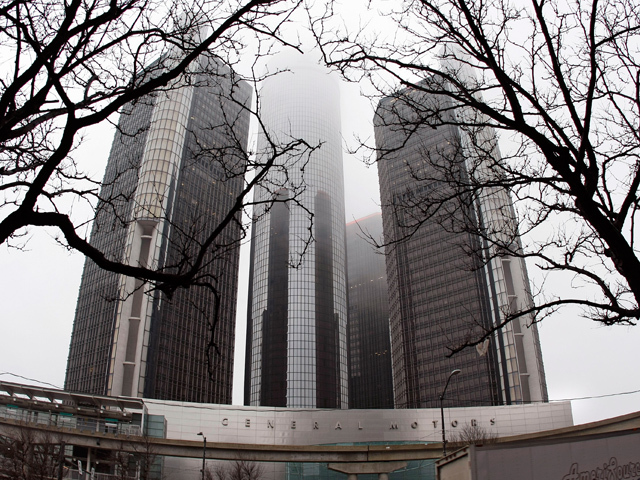 GM has been third at least since 2008, the year before it entered bankruptcy protection. But spending is down from recent years. GM spent just under $2.2 billion on ads four years ago. The company decided to stop spending $10 million a year on Facebook (FB) ads that appear on people's personal walls because they weren't generating interest in the company's vehicles, Ewanick said. GM research, he said, showed that people viewed the ads on their walls as an intrusion. "It's like having a night out with the family and somebody comes up to your table and says 'Hey, excuse me, I've got this car out here I want you to buy,'" Ewanick said. The company is thrilled with the response to the Facebook pages set up for its brands and cars and trucks, and it will keep making video and other content for them, Ewanick said. Facebook doesn't charge for those pages. Messages were left seeking comment from Facebook. As for the Super Bowl, GM was happy with the response to ads during this year's game. But the price increase for next year's game was just too high for an audience that isn't growing much, Ewanick said. GM already is reallocating the Super Bowl money. Much of it will go to other NFL games including the AFC and NFC championships, which have audiences that are near that of the Super Bowl, he said. Under the soccer deal, Chevrolet's bowtie logo will appear on Manchester United's team benches and in its stadium. It won't be on the team's jerseys. GM also gets access to players, who will attend events and serve as spokesmen for Chevrolet. Chevy also will sponsor two preseason matches in China. Manchester United will play against Shanghai Shenhua and a yet-to-be announced team. GM, which is replacing Germany's Audi as Manchester United's automotive sponsor, wouldn't say how much the deal cost. But Ewanick said the team's huge following is an example of how GM is looking for advertising that reaches across the globe, something it hasn't done well in the past. "Everywhere I travel in the world, I run into Volkswagen or Hyundai or Toyota, who are doing this very, very well," he said. "It's not a big secret. I think others will tell you that we don't go a great job marketing internationally." Manchester United got its fan base data from the Kantar research firm, which surveyed 54,000 people in 39 countries. A similar survey in 2007 indicated that Manchester United had 333 million fans, based on 27,000 responses.